When I first heard/ saw the word attachment parenting, I thought to myself that I am actually doing it. We are doing it. Because mom would just say "dibadan-badan jua Iqbal ani" and few other lines which mean the same thing. I just love to have him close to me. Close to us. After all this is probably the only time we can be this close. 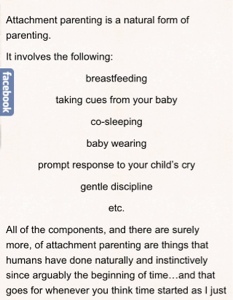 I have not research or read further on attachment parenting. Then I came across this (shared by DDLS on Facebook) and it caught my interest. Attachment parenting is easy. I mean its the simplest form of parenting. It does not cost so much. Breastfeeding is almost free (some need to buy vitamins and booster to maintain the supply. But the truth is, as long as there is demand the supply will always available. For most people.) I do not like to hear Baby Iqbal cry most of the times and sometimes he will just scream to get attention which I do not mind. I need enough sleep though because if not, I will be grumpier than Baby Iqbal. Then again enough sleep does not mean I want Baby Iqbal to sleep throughout the night nor I am. I'll be worried sick about him. I know he'll either cry or continue sleeping in hunger (and my thought is always the latter! ).